On our way to the next story location I managed to, single-handedly, blow up the electronics in our rental car -- a nice, peppy 6-speed Mercedes wagon that when I'd picked it up had gone only 2,000 km. All I did, quite innocently enough, was go swimming with the car's electronic key in my pocket. Apparently, something about its tiny circuit board was allergic to salt water. After my swim, I discovered the key was completely dead. Attempting to remedy the situation, I took the key apart (using the illustrations in the German-language owners' manual as a guide) and dried it out for several hours on the car's dashboard in the sun. Still, nothing. It appeared as though we'd be stranded in a small town square on the southern border of Spain for, perhaps, the entire weekend. I was soon hit with an inspiration for a faster way to dry the key. I noticed a child playing in a fenced-in yard and hoped he could help. I knew enough Spanish words that I was able to make him understand I wanted him to ask his parents to come talk to me. Then, truly stretching both my use of Spanish and his mom's credulity, I managed to convey that I wanted her to dry my key by using her electric hair dryer set on the 'frio,' cold, setting. Unfortunately, she apparently understood everything except the part about using the cool setting. When she brought the key back across the yard, it was still very hot to the touch. With little hope, I put it into the ignition. The result was like one of those good news/bad news jokes. Although, happily, the key then started the engine, significant portions of the car's electrical system had become inoperable. This included the ability to activate either the driver or passenger windows, both of which were rolled all the way down. Although annoying, that 'minor' inconvenience paled in comparison with the fact that the headlights were stuck on the high-beam setting and the taillights and brake lights were permanently illuminated. I rationalized we really didn't really need the speedometer or any of the other non-working gauges that were also now defunct. Since we were in a very small beach town, and nightfall was quickly approaching, we decided to drive toward the nearest Avis location. This turned out to be in Porto, Portugal, located 90 kilometers to the south. It was a wild ride, featuring a number of other drivers honking, flashing their lights and/or 'waving' at us along the way. Fortunately, it was a warm, clear, full-moon night and, best of all, the car stereo still worked fine! And, given the car's license plates (since I'd rented the car in Hamburg) everyone would have thought we were Germans... Porto came into view just before midnight. The following morning, the Mercedes Response Team members told us a new key would have to be sent from the main Mercedes factory, which would take 4 to 5 days to get to us. We simply couldn't wait that long, so we exercised 'option B'; we traded in the Mercedes for the biggest and best car the folks at Avis of Portugal had to offer -- a silver, Opel Vauxhall van. It was a poor swap, but there was really no choice given our time schedule. Thus, with only one day's delay, we arrived at our next sweeping stop, Portugal's walled city of Évora. If you're responsible for sweeping one or more of the historical districts in your town, you're aware that it's sometimes difficult to match today's technology with an infrastructure created in times long past. So, imagine having to clean an entire historical city that, in some parts, dates back to the first century AD! That's the challenge facing the street cleaning department of Évora, a beautiful walled city in Portugal. Évora is comprised of very old buildings with extremely narrow streets constructed entirely of stone pavers or bricks. Every day, an enormous tourist trade takes place inside the walled portion of the city, as well as (to a lesser extent) in the more modern part of town that has grown up outside the castle walls. These factors present a significant challenge to any pavement cleaning program. However, Évora's managers have adapted their maintenance methods to their city and are, for the most part, doing a fine job. Over 95% of Portugal's citizenry is Roman Catholic. In most areas of the country, the early inhabitants completely rejected all previous religions when re-doing their architecture. Although Catholicism is currently reflected in the area around Évora, the ancient inhabitants of this particular area did something quite unusual, which was to be more inclusive in the interpretation of their religion. Instead of destroying all the existing religious structures, they simply modified them for their own use. They built chapels on dolmens, revamped mosques into Christian churches and, at the same time, retained a unique closeness to nature and an ongoing commitment to the environment that still exists today. Today's Évora is a city of contradictions. Although loaded with history and ancient architecture, it's planted squarely in the fast-paced environs of the worldwide tourism industry of the 21st century. By all appearances, its citizenry is more committed to recycling than the inhabitants of most European cities I visited. There are separate bins for glass, paper and metal available throughout the city, and the citizens seem proud to participate in this program. However, the challenges faced by the town might well be characterized by the cartoon I spied on Cordiero's office wall. According to Cordiero, the city has 20 employees on the job every day (except Sunday) cleaning the city by hand, using a broom and wheeled cart arrangement. Each worker is responsible for cleaning a specific geographical region of the city. In the photo, you can see yours truly doing a little sweeping using the equipment left 'available' during someone's lunch break. 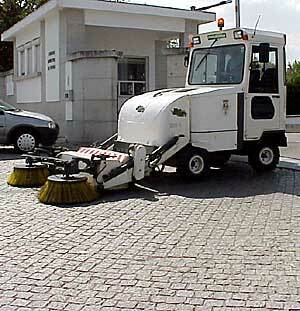 In addition, the city has two Piquersa-brand sweepers like the one shown in the animated photos. 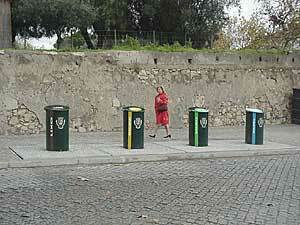 These machines are made in Spain, and are used for cleaning the main streets of Évora. During the day, they're operated in the part of town that lies outside the walls, then are brought inside the walled portion of Évora for nighttime cleaning. Both of these machines are operated by a two-person sweeping team. One worker sweeps the corners and other areas the sweeper can't reach, while the other worker operates the sweeper itself. Piquersa sweepers are strictly mechanical in operation, having no suction component. Over time, the city managers have determined this type of sweeper works best for cleaning the sand-bedded brick road surfaces that are found throughout the walled portion of the city. "At one time we tried a Ravo vacuum sweeper with a 2-meter hopper, but we had many problems," explained Manuel Cordeiro, the sweeping manager with whom this interview was conducted. "With each sweeping it would remove some of the sand, and that would loosen the bricks. Using it, we had to repair the roads much more than we do now. Also, because the sand is so fine, it made the sweeper break down all the time. We had to fix the Ravo sweeper over and over, because the sand broke the engine and many other parts. Our budget couldn't support those type of repairs; it was just too expensive to operate. "The cleaning performance of the Piquersa sweepers is very similar to the Ravo, even though their pickup system is strictly mechanical. The way they operate doesn't remove the sand bedding in our roads, and they are also quite dependable. Day after day, we simply fuel them and operate them. We've run them five days a week, during both day shifts and night shifts, for seven years and they simply don't break." As in other cities where the streets are made from cobblestones, Évora has a problem with removing small items (primarily cigarette butts and broken glass) from between the cracks. I asked if they'd tried using any type of cement product to bed their roads, instead of the sand used since ancient times. "Yes," replied Cordeiro, "but it made the roads more fragile and the bricks popped up more easily. Where cement was used, the road broke quite often. The color of the cement is also difficult to match when replacements are made over time. Plus, the use of sand to make the roads is traditional, and we take great pains to retain our city's historic past in everything we do." Because of their cobblestone construction, portions of the streets are always in a state of repair. When the bricks sink, come loose, etc., the 'bad' stones are removed and sand is packed in the hole until repairs can be made. Sweepers are not allowed in the area until the new stones are fitted into place. The photo animation shows an example of an area waiting for repairs, and another where the repair of the street was in progress. The city also owns two, small, Portuguese-built sweepers that have extendable suction hoses. They're powered by 5-hp Honda engines, and appear to be much like the Madvac machines most readers have seen operate in the U.S. They're used to clean areas the Piquersas can't reach, as well as for emptying the wheelbarrows of the manual sweeping team. 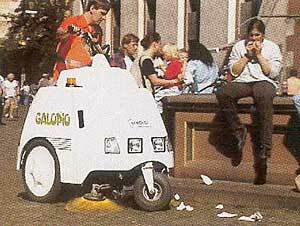 Additionally, they owned a 3-wheel sweeper, made by Galapao, that operated by a broom-and-conveyor system. However, Cordiero said, this machine was seldom in use because it "is filled with moving parts that keep it broken down much of the time." Because of Évora's heavy tourism traffic in its historic areas, garbage is removed seven days per week throughout that part of the city. As part of the city's commitment to cleanliness, the rest of the town has garbage service five times a week. The majority of the city's garbage containers are underground, with an above-ground tube for depositing garbage bags, etc. The garbage trucks lift the 3-cubic-meter 'vault' of garbage out, then empty the contents, much like is done with a standard roll-off container. The underground system allows for selective collection, since the truck operator can look inside to see how full it is before deciding whether or not it needs emptying. All sweepings, whether from the hand-sweeping crew or the machine sweepers, are mixed in with the city's garbage prior to disposal. Although tourist traffic was heavy when I was there, most of Évora's streets were very clean and the garbage cans weren't filled to overflowing, as they'd been in some of the other tourist cities I'd seen. A few of the small side streets didn't appear to be getting the same level of cleaning attention as the more heavily traveled main plazas. However, that could simply have been due to the length of time it had been since that area's worker had been there to clean the areas I happened to see. I did spot a few places in the city in need of some attention. One was a small, grassy, picnic-type area that was littered with paper and other small debris. Another was a fountain that wasn't in operation and, as a result, was filled with mosquito larvae. As it turned out, neither area was maintained by the street cleaning department. These were, rather, the responsibility of another agency in the city. Since the cleaning department has workers in the vicinity every day, perhaps a change of responsibility is something the city might consider. Évora was one of the most unique cities I've ever seen, a city that stands out even in Portugal, a country filled with historic and unusual towns. 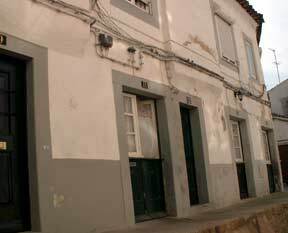 Because of its history, many of Évora's side streets were especially narrow. And, since the town is built on a hill, as were most all castle fortresses, some of the streets were quite steep, as well. Due to the historical nature of Évora's building structures, it's been difficult for the city's agencies to keep up to date with the requirements of changing times. 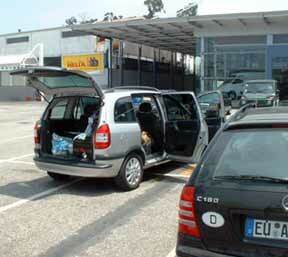 For example, here's a photo showing what was needed in order to bring Évora into the 'electrical age.' Apparently, the only way to get electricity from house to house was to run the wires along the outside of the buildings. When structures are made from stone, it's much more difficult to add needed electrical service to current structures. A similar challenge exists for the city's street department. Although committed to keeping the historical look and feel of bygone times -- which means re-building roads with bricks/cobblestones and sand -- the department still has to do its best to keep the pavement clean, given the demands of an extremely heavy tourist load. To this visitor, it was clear the street department is performing the effective balancing act of retaining the city's history while maintaining a reputation for 21st century cleanliness. If the city always looks the way it did when I visited, Évora's tourism trade will continue to flourish. Thanks again to Évora's Manuel Cordiero for his willingness to be interviewed even through the language barrier. Although the city has a fine website, unfortunately it is in Portuguese. Manuel's best language is also Portuguese, however he is available via email sent to: cmevora.mcordeiro@mail.evora.net. Our next story comes a mile above sea level, in the rarified air of Switzerland's Monch, Jungfrau and Eiger mountains. There, in a very small village called Murren, you'll catch a glimpse of a summer road sweeper unlike any you've ever seen before.